Posted in Blog on September 8, 2017 . 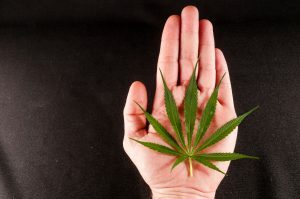 There are three different types of Cannabis – Sativa, Indica and Ruderalis. It is very important to understand the differences as some strains will be better for certain types of chronic pain than others. Cannabis Sativa strains originate from places like Mexico, Columbia and South East Asia. In an outdoor environment they tend to do very well in equatorial regions where there is almost an even number of dark hours, to hours of sunlight in a day. The type of high from a Sativa strain is typically a very ”heady” euphoria. It’s the type of cannabis that could have a person in fits of laughter or hearing depth to music that they may have never noticed before. You are likely to feel more energetic and social and it can even be stimulating. Some Sativa strains are very good for pain relief and these tend to be more of a ”daytime” strain. 1) They can get very tall very fast and most people are growing in confined spaces. 2) They often have long flowering periods – usually around 10-16 weeks. (Meaning they take longer to grow). Cannabis Indica originates from the traditional hash producing regions like Morocco, Afghanistan and Pakistan. The plants tend to grow shorter and stockier with broader leaves and a darker green tinge. They tend to have much shorter flowering times than Sativas, generally 7-9 weeks. The high from an Indica is more of a ”body buzz” and this is one of the reasons Indica is used more often for chronic pain conditions than Sativa strains. It is often extremely relaxing and sedating and can sometimes feel narcotic. This is the type of Cannabis that induces what is referred to as ‘couch lock” which is when someone is so relaxed that they may start to feel ”at one” with the couch. Indicas tend to be used as a night time strain and they are extremely effective for both insomnia and chronic pain. Indicas generally have a higher CBD content. After THC, CBD is the most prominent Cannabinoid in Cannabis medicine. It has many medicinal benefits and works synergistically with THC in combating chronic pain. 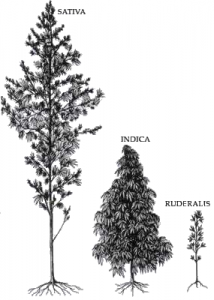 Cannabis Ruderalis is a wild variety of cannabis that originates from Russia. They tend to be much shorter plants and also have a Cannabinoid profile that many believe to be closer to hemp than Cannabis. As a result they have much lower levels of THC which is why they are not particularly appealing to recreational or medical users. What makes them unique is that unlike Sativa or Indica varieties, they do not rely on a light schedule (photoperiod) in order to mature and bloom but rather, they mature according to a timeline or maturity. Sativa and Indica will go through two main stages – vegetation and bloom (flowering). This is determined in nature, by the length of the days. During spring and summer the plant will go through its vegetative stage and as the days get shorter as late summer and early autumn approaches, the plant will start preparing to reproduce and thus it will begin flowering. Indoors this can be controlled by changing the light cycle when desired. 18 hours of light and 6 of darkness is what indoor growers generally use for vegetative growth. Once the plant is the desired size the light schedule will usually be changed to 12 hours of dark and 12 hours of light. This will induce flowering. Ruderalis on the other hand has adapted to the regions it originates from where there is sunlight nearly all day long in midsummer and so it matures based on age and not a light cycle. As mentioned the levels of THC are much lower so instead of using Ruderalis for medicinal or recreational purposes, people have rather bred them with Sativa and/or Indica strains. This creates an interesting trait in the hybrid which is commonly known as Automatic strains or Auto’s for short. It means that breeders have been able to create strains which have the desirable traits from the Sativa/Indica heritage such as a higher Cannabinoid profile while at the same time they are effectively like Ruderalis in that they will flower automatically and no longer rely on the light schedule in order to grow and flower. There is a long held perception that Auto’s are sub standard even though breeding projects have improved them exponentially over the years. We are NOT going to be recommending you do anything with Auto’s if you are just getting started. They sound like they are easier to grow in theory but the reality is, they are more sensitive to human error and it is very easy to cause them stress that will impact your yield. These plants and their Cannabinoid profiles should definitely be explored further and several people we have spoken to and interviewed say they can work really well for pain and other conditions but at this stage they can be hit and miss, they generally have a slightly lower Cannabinoid profile which is not what we want right now. They are worth experimenting with on the side but NOT at the expense of your regular supply of pain medicine. Hybrids are usually a cross between a Sativa and an Indica plant. Some hybrids will be Sativa/Sativa or Indica/Indica but the majority of them have both, somewhere in their genetics. This often balances out the Cannabis strain and gives it a few properties of each of the parents. So for example if a breeder has a Sativa strain that is good for pain relief but it also has some undesirable traits such as being too racy and prone to induce a bit of anxiety or paranoia, they could breed it with an Indica which may tone down the raciness and make it more relaxing. At the same time the Sativa influence means that it will not induce ”couch lock” or heavy sedation. Breeders are often looking for a balance, which can make the experience more medicinal and pleasant. Through generations of breeding, certain desirable traits can be isolated meaning that those traits will be passed on to the offspring. Breeding is essentially about creating new breeds of Cannabis and as importantly making those desired traits appear in the offspring with as little variation as possible (phenotypes). Much like any genetics, including human, the offspring could exhibit dominant traits of the mother or father. Multiple generations of breeding keeps the variation (phenotypes) down to a minimum and allows for more uniform plants from a batch of seeds while retaining the desirable traits. Breeding is very advanced and far beyond the scope of this article but it is important to have an understanding of the different varieties. Depending on how it was bred, the plant could be anything from a 50/50 split to 5/95 split. A true hybrid would be a 50/50 split between Indica and Sativa and a plant with say 60% Indica and 40% Sativa would be an Indica dominant hybrid. Most commercial strains these days are hybrids and it has almost become challenging to find ”pure” breeds of cannabis. These are called landrace strains and while there are quite a few out there that have not been bred with any other variety other than their own, you would generally need to buy the seeds from a breeder who specialises in landrace strains. Although these don’t technically fall under a different species of plant, it’s worth discussing them separately. Many strains can be considered medicinal for a variety of reasons and these include strains with high levels of THC and low CBD. Strains with a higher CBD content are however generally the ones with the medicinal or ”good for pain” title. One of the reasons for Indica being the preferred option for pain relief is because of the naturally occurring higher CBD content and the body buzz which helps so much with chronic pain. This does not mean that all Indica is superior for pain relief. Many people find more relief and functionality from Sativa plants and often it is pain specific too. Cannabis can in some cases become more effective as an aide for medical conditions when the Cannabinoid profile is more balanced between CBD and THC and for the last few years several breeders have been working on these hybrids. Many of these ”medical” strains have been bred to produce roughly equal amounts of both THC and CBD and they have been bred, both as Sativa and Indica dominant strains. So for instance let’s say an Indica strain has a THC content of 18% and a CBD content of 3%, this in theory would be considered a good strain for medicinal needs. What the breeders of the newer medical strains have done however, is to create plants with a much lower THC content and a much higher CBD so an example would be a plant with a THC content of 8% and a CBD content of 8%. 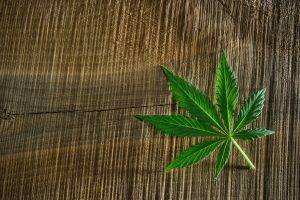 These strains are sometimes referred to as 1:1 strains indicating the ratio of THC to CBD being relatively equal. Obviously this will tone down the high a person gets from the buds while at the same time offering significant relief. We do recommend these strains as they have been bred for the purpose of helping with various conditions but at the same time we don’t want to discourage you from trying some of the regular commercial strains. It is quite possible that a higher THC and lower CBD strain could actually be more effective for you depending on your type of pain. This is your medicine to personalise to your needs, never forget that. When it comes to choosing whether to opt for a Sativa or Indica dominant 1:1 strain the same general rules will apply, Sativas are generally better for daytime use and Indicas to end your day and drift off into peaceful sleep.